If you have the opportunity of starting with your cat as a kitten, practice by opening his mouth and massaging his teeth and gums. Ears and paws should also be gently massaged. Introduce new grooming activities one at a time; take baby steps to attain your goal. 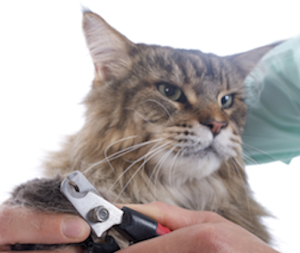 If the cat’s coat is badly matted, consider giving yourself and the cat a “fresh start” by having the cat shaved by a groomer and then maintaining the coat yourself as it grows back. Use treats, praise, and petting to let your pet know that you approve of his tolerant behavior. Never scold–keep the experience positive. Try to stay business-like throughout any procedure, so that you are not inadvertantly reinforcing the cat’s fear with too much sympathy. Ask your veterinarian to describe to you or to show you techniques for giving your cat a pill, a liquid medication, and ear or eye drops. Be patient, gentle and firm when giving medications. 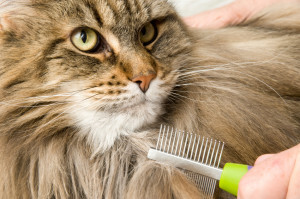 While working with the cat to condition it to accept various types of handling, be sensitive to the cat’s reactions and DON’T try to hold (or restraine) a cat that is becoming irritated (tense body, flattened ears, twitching tail). Let an annoyed cat have his way and try again later. A frightened or angry cat can hurt you and a bad experience for the cat can reduce your chance of success next time. The key is to keep this training to short, positive sessions.